Above, Michelle Obama speaks at the 2016 Democratic National Convention in Philadelphia, noting that she lives in a house built by slaves (11:20 in the video above). Rightwingers were quick to call her a racist for failing to mention that low-wage white laborers contributed. If you can’t tell the difference between slavery and low-wage labor, you might have voted for Donald Trump. Since its beginning as a colony, America has relied upon the labor of non-white immigrants (whether brought here voluntarily or violently) and their descendants. Our system of capitalism—and our roads and railways, our farms and factories, our White House—was built upon their labor, sacrifice, and suffering. Nearly everything you did today—if you ate at home or a restaurant, if you visited the doctor, if you shopped online—happened because of the work of immigrants of color. And yet they are repeatedly targeted as threats to America by the Trump administration, the Republican Party, and violent white nationalists. Their potential punishment isn’t simply deportation or a ban from the country; as last week’s murder of an Indian national in Kansas shows, if you are an immigrant of color, you are a target for killing, and America’s white leaders will not care. Slave, sharecropper, migrant field worker, high tech H-1B visa holder—it does not matter how you contribute. Your work IS the work that makes America great, but like Srinivas Kuchibhotla, you may need to be sacrificed to maintain Trump’s America First order of things. 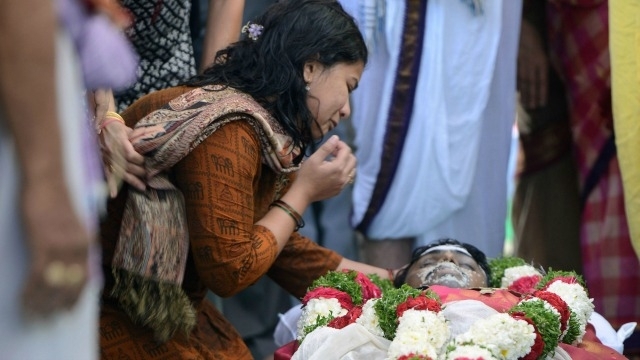 Above, Srinivas Kuchibhotla’s widow participates in her husband’s funeral in Hyderabad, India. Sunayana Dumala asked for answers from Washington, “I need an answer, I need an answer from the government. I need an answer for everyone out there…. Not just for my husband … but for everyone, all those people of any race.” Kuchibhotla’s friend Alok Madasani was also injured, as was Ian Grillot, a young white man who intervened. This is not new. Whites have always used terrorism as a tool to maintain white supremacy even as they also exploit the labor of people of color. In its economic nationalism, the Trump administration has reinvigorated white supremacists who feel entitled to the product of others’ labor and also to violence against them. Trump fosters this in his refusal to address rising anti-Semitism and in his failure to condemn terrorism by violent white extremists who invoke his name. Indeed, he ignores the relationship between his hate mongering and hate crimes, calling himself the “least racist” and “least anti-Semitic” person in the world—words to cleanse his conscience and assure his supporters than they bear no responsibility for violence against immigrants of color. But as long as violent white supremacists believe that Trump is winking when he says them, they will continue to act on what they hear as his call to terrorize. When they, like Kuchibhotla’s killer, yell, “Get out of my country,” before they knock over Jewish headstones in St. Louis or Philadelphia, build a bomb to kill Somali immigrants in Garden City, Kansas, or open fire at a bar in suburban Kansas City, they understand themselves to be living out Trump’s executive order and acting on his “violent immigrant” registry, no matter how many times Sean Spicer denies it. Headstones at a Jewish cemetery in Philadelphia were desecrated this week. Donald Trump suggests that Jews themselves probably did it in order to make him look bad. Like the Trump campaign, the Trump administration is calling for an economic nationalism and fear of brown-skinned immigrants that some will understand as permission to harass, intimidate, and even kill immigrants of color or those perceived to be immigrants of color, regardless of their nation of origin. Trump’s silence in the face of rising hate crimes signals to white supremacists that they may “massacre without breach of religion,” “so that there may be no impiety in slaying them, ” “so that killing them would not pollute the killer.” Such violence outrages every decent person and shames the US in the eyes of the world—but cannot be truly condemned by a White House preaching a message of nationalism and fear.